Facebook Recommends Square Aspect Ratio for Link Ads! In a recent blog post on Facebook, Andy Xiong mentioned that after April 30, 2019, latest Marketing API version will not allow ads to leverage the 191x100 crop ratio. The specification will still be available for previous API versions but only until they expire. Moving forward, 100x100 will be the recommended crop size. According to the company itself, the initial test results of 1:1 link ads were quite positive. Not only is there improvement in the conversion rate, but the click-through rate has been much more impressive too as compared to the original landscape aspect ratio (1.91:1). Thus, the company strongly recommends the new square aspect ratio to be used moving forward. "We recommend that advertisers leverage 1:1 (square) image creatives for their image link ads. This should also provide more flexibility to use the same creative across Facebook and Instagram placements." However, it should be noted that old landscape formats, although not set to default, will still be supported. Moreover, the landscape will still be the default for non-ads page posts. "The update is only for Facebook link Ads not for Page Posts. The image ratio actually depends on which Ad placement you choose. Lets say, you are running Ad on Facebook Feed, so the ratio will be 9:16 to 16:9 (without link) and with link the ratio will be 1.91:1 to 1:1. Similarly, you can see all the Image ratios as per the Placement in our help center article here: https://www.facebook.com/business/ads-guide/image/facebook-feed. The Facebook family supports multiple advertising types across Facebook, Instagram, Audience Network and Messenger. Each Ad has two components: The format (what it looks like) and the placement (where it will be displayed). This guide outlines the requirements for advertisements in each format and placement. Please refer to it for specs such as dimensions, file sizes and character limits https://www.facebook.com/business/ads-guide." 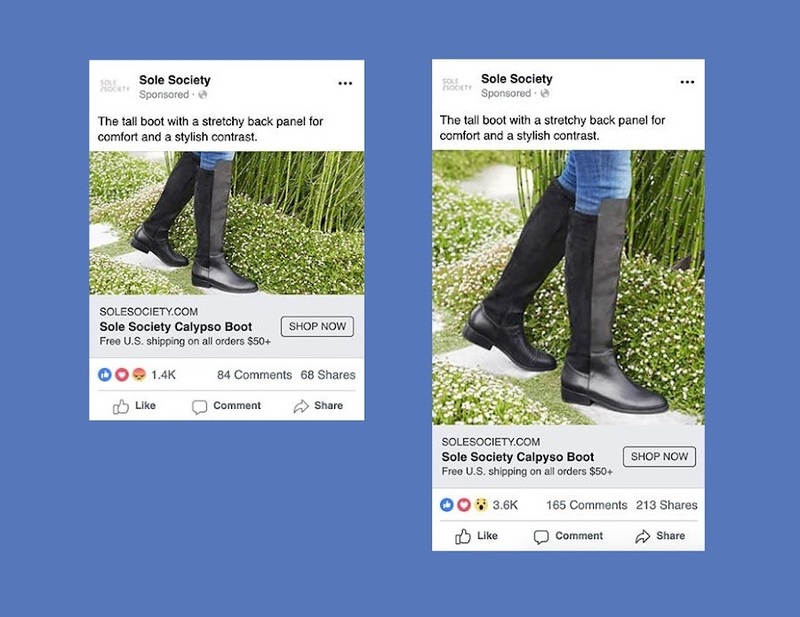 Digital marketers are considering this to be a smart move on Facebook’s part as now the company will be able to generate more ad revenue from automatic ad placements, especially across Instagram, from advertisers that are considered too lazy to come up with something catchy in its own right. On the bright side, these ads are much more visible and consequently, effective! The improvement in performance can be attributed to the fact that they take up more screen real estate. It remains yet to be seen whether Facebook succeeds with this approach or not, in the long-run. Only time will be able to answer that.